Shadowy liberal groups helped propel to victory a gubernatorial candidate who has led the fight against undisclosed “dark money” and championed transparency in political spending. Democratic Gov. Steve Bullock led Montana’s efforts (click here) during his tenure as the state’s attorney general to undermine legal protections for private corporations and nonprofits that speak publicly about political issues. The headquarters of the Democratic consulting firm Hilltop Public Solutions appears to be one such Washington, D.C. office building: It serves as the mailing address for a number of pro-Bullock independent expenditure groups that were active during his election campaign. Meanwhile, Hilltop was receiving payments directly from the Bullock campaign. Disclosure forms show that the Bullock campaign paid Hilltop for travel expenses and a series of conference calls throughout the year, as first reported by Media Trackers (click here). Hilltop’s involvement in the conference calls themselves is not clear. The governor’s office did not respond to a request for comment. However, Kevin O’Brien, the governor’s deputy chief of staff and former campaign manager, told USA Today (click here) correspondent John Adams that allegations of coordination between the campaign and independent expenditure groups are “unsubstantiated and misleading,” though O’Brien declined to directly deny the allegations. Hilltop did not respond to questions about its involvement in Montana’s gubernatorial race. 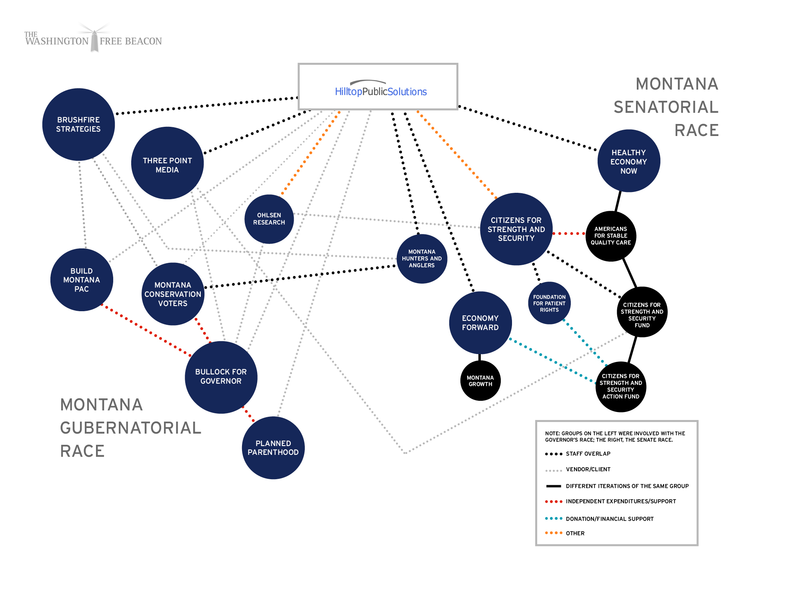 However, publicly available information suggests that the group was coordinating a large effort through both direct work for the campaign and a web of “independent” groups to elect Bullock. Shortly after receiving payments for those campaign-related conference calls, Hilltop began work for a pair of political action committees, soliciting fees in exchange for work supporting Bullock’s campaign. One of those committees, Planned Parenthood Advocates of Montana, paid Hilltop for salaried canvassers, mailings, and “management fees” in support of the Bullock campaign (click here for proof). Hilltop associate Molly Bell also coordinated hiring for Planned Parenthood activists during the campaign, according to a post on the group’s Facebook page. A union-backed 527 called the Build Montana PAC paid Hilltop $9,000 (click here for proof) for graphic design services that appear to be associated with a mailer supporting Bullock’s campaign, for which printing and mailing fees were paid to another vendor on the same day. Build Montana PAC also enlisted the services of a firm called Brushfire Strategies, whose founding partner, Marco Guido (read about it by clicking here), is a principal at Hilltop. Build Montana paid Brushfire more than $12,000 for phone banking in support of Bullock. That payment was mailed to Hilltop’s Washington D.C. office, at 1000 Potomac St. NW, Suite 500. A state environmentalist group called Montana Conservation Voters (MCV) also hired Hilltop (click here to verify) to support Bullock’s campaign, making multiple payments for campaign mailers. Hilltop associate Joe Splinter was MCV’s development director until 2011. MCV also paid Brushfire Strategies (Click here to verify) Bullock phone-banking. Those payments were also mailed to Hilltop’s office. Splinter was also listed as the treasurer (click here for verification) for an independent expenditure group called Montana Hunters and Anglers Leadership Fund, which was active in the 2012 Montana Senate race. That group paid Brushfire (click here) to conduct get-out-the-vote calls in November, and mailed the payment to Hilltop’s headquarters. The Bullock campaign also paid tens of thousands of dollars to Democratic media firm Three Point Media, which was founded by Hilltop partner Mo Elleithee (click here for bio), for multiple television ads (click here to see them). Those payments (click here to verify), made over the course of several months, were also mailed to the office at Potomac St., which Three Point Media lists as its headquarters. Three Point Media has done work for a 501(c)(4) group called the Citizens for Strength and Security Fund (CSS Fund), producing multiple ads for the group during the 2012 election cycle. The CSS Fund was created by Hilltop in 2009 to advance liberal health care proposals. The Bullock campaign also mailed payments for an opposition research vendor to Hilltop’s office. Campaign finance disclosures show two payments to Eric Ohlsen (click here to verify), who heads the Democratic research firm Ohlsen Research. Ohlsen’s relationship with Hilltop is not clear, but the metadata for the group’s website includes the phrase “Hilltop Public Solutions” and its website lists an office at Hilltop’s Potomac St. address. Ohlsen’s clients also include a group called Citizens for Strength and Security (distinct from the CSS Fund), which also has ties to Hilltop (click here). Bullock was more forceful in his State of the State address. However, Bullock himself appears to have supported the organization behind Citizens for Strength and Security and a host of other shadowy liberal groups. None of the groups contacted for comment by the Washington Free Beacon responded, but the many links between them suggest Hilltop played a significant role in coordinating both independent and campaign-related activities that led to Bullock’s electoral victory. For a diagram of the whole charade, click here.